The importance of saving money is regularly emphasized by personal finance experts, financial planners and frugalistas, yet many Americans still find themselves practically incapable of saving enough money to pad their emergency funds. To understand how many Americans save money and how much they keep in their savings, GOBankingRates, in partnership with Penny Hoarder, released a poll through Google Consumer Surveys, asking respondents to identify how their savings stack up. 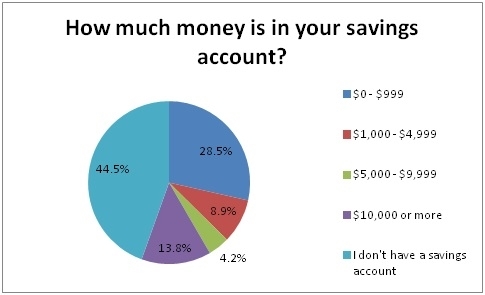 The poll sampled more than 3,000 participants and asked: How much money is in your savings account? Read GOBankingRates’ analysis on the effect behavioral finance has on Americans’ ability to save money. Below are the complete findings of the survey, with a number of demographic insights, including age, income and region. Key Findings: How Much Do Americans Save? Those aged 18- to 24-years old and 65 and older are the most likely to not have a savings account, at 44.2% and 40.8%, respectively. 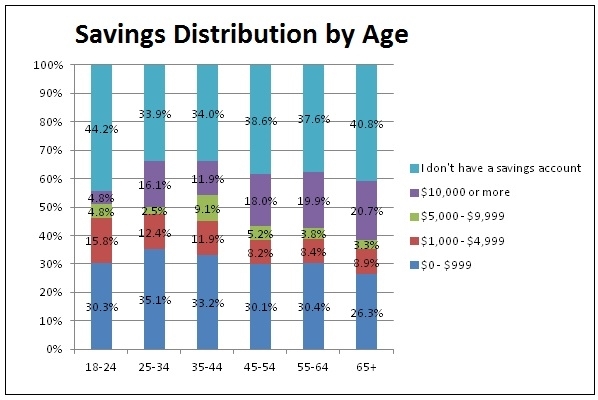 74.5% of respondents in the youngest age bracket (18-24) have zero or minimal savings. They were most likely (by a 5.5% spread) to fall within this category. Savings seem to dip between the ages of 45 and 64, likely because this is the time in Americans’ lives that they spend their money (either on necessities, like college education and house down payments, or on luxury, like travel). 68.6% of those aged 45 to 54 and 67.9% of those aged 55 to 64 have savings of less than $1,000. Savings are greater for 35- to 44-year-olds and those 65 and over. The more you make, the more you save. The results found that only 23.9% of respondents in the lowest income bracket ($0 to $24,999) have savings accounts with $1,000 or more in them. 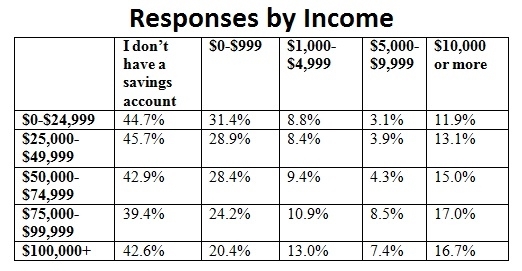 By contrast, 37.0% of respondents in the highest income bracket ($100,000 or more) had savings of $1,000 or more. The relationship is evident across all income brackets. A person’s income level is the best indicator of their savings account. Respondents in the South are most likely to have no or minimal savings by 79.2%. 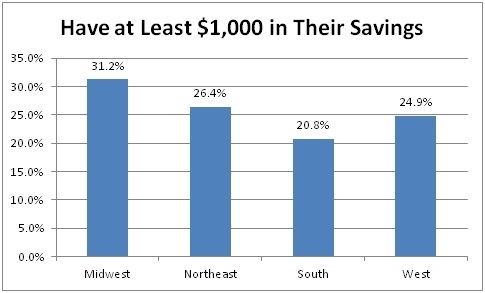 Respondents in the Midwest tend to have the highest savings, and 31.2% have savings of at least $1,000. By contrast, of those in the South, only 20.8% have savings of $1,000 or more, a difference of 10.4%. The poll found that rural, suburban or urban demographics do not determine a respondent’s likelihood of saving money. Based on the data, it can be inferred that people living in rural areas are more likely than those in urban or suburban areas to have a savings account, with suburban dwellers being the least likely to have a savings account. 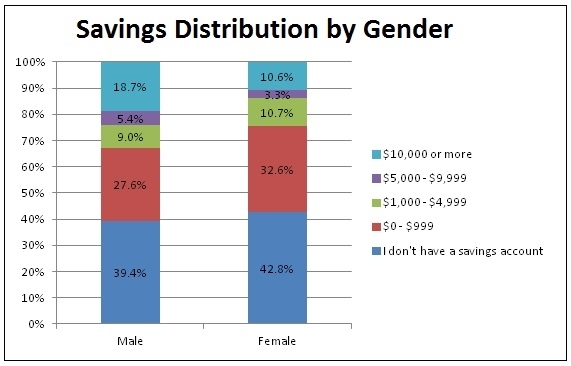 Men are better savers than women; 33.0% of men versus 24.6% of women have savings of at least $1,000. 42.8% of women said they do not have an account, compared to 39.4% of men, meaning women are more likely to not have a savings account. Fiat is the world’s eighth-largest automobile manufacturer — its products and business model have garnered numerous awards. Here’s a closer look at what the company is currently worth.